At One Community Health, everyone is welcome. One Community Health has been an essential provider of medical, dental, maternity, pediatric, and health promotion in the Columbia Gorge for over 30 years. 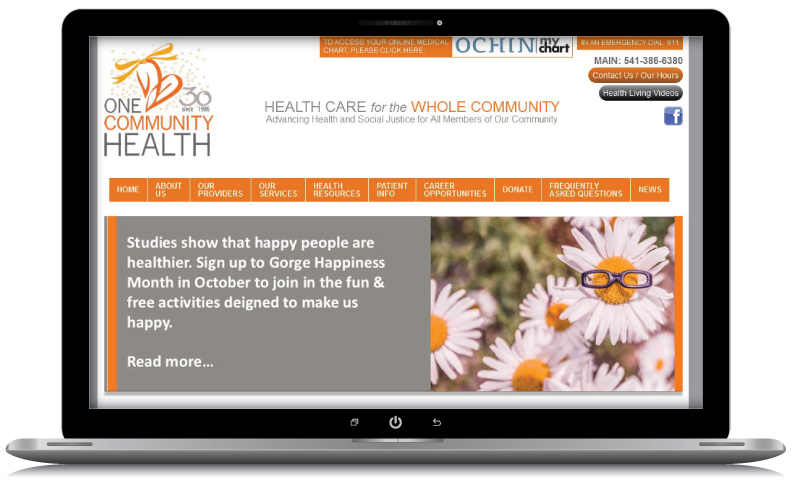 When One Community Health entered a new age of health care with the opening of a new facility, they equally wanted a state-of-the-art online presence that matched this. This is where WebRock stepped in – creating a site that provides a easy and friendly platform for patients to obtain information and schedule appointments, along with engage with the team at the clinic. Additionally, the website gives providers the opportunity to share their knowledge and educate about their passion for the work they do. The web is highly programmed using the HIPPA rules and regulations so medical staff can access medical charts online.